The word “geode” is derived from a greek word that means “earth like”. And they are! Geodes are a secondary formation from sedimentary and volcanic rock. Hollow and circular, they often include secluded crystals, which thrill and fascinate kids and adults alike. How do these beautiful crystals form? The formation of a geode can form in various cavities, such as gas bubbles, vesicles like basaltic lava or in basic sedimentary formations. After millions of years, the rock around the cavity naturally hardens around the fillings while silicates and carbonates are deposited on the inside. Ground water and hydrothermal solutions, over time, contribute to the beautiful crystals that appear within the hollow chambers. The insides of a geode can be magical. One never knows what to expect in terms of coloration, shape and gem quality. 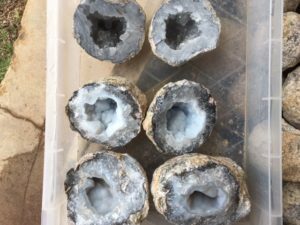 Various “impurities” determine the hues within a geode. From iron stand quartz to amethyst, chalcedony, jasper or agate, each one is a complete and total surprise. While geodes are abundant in caves, mines and key geographical territories in the U.S, some other regions are particularly known to offer some of the most beautiful specimens in the world, regions like Chihuahua, Mexico! Here at the Mammoth Mine Rock Shop, we are particularly proud to offer geodes from Chihuahua, Mexico. Mined deep underground for centuries by the people of the region, these beauties glow in emerald hues when placed under a black light. But this feat may not be as interesting to collectors as the idea that they, themselves, are opening something that has been closed for millions of years! Come on in to our shop to view and admire, or to give yourself or a loved one a ver, very special Christmas gift!